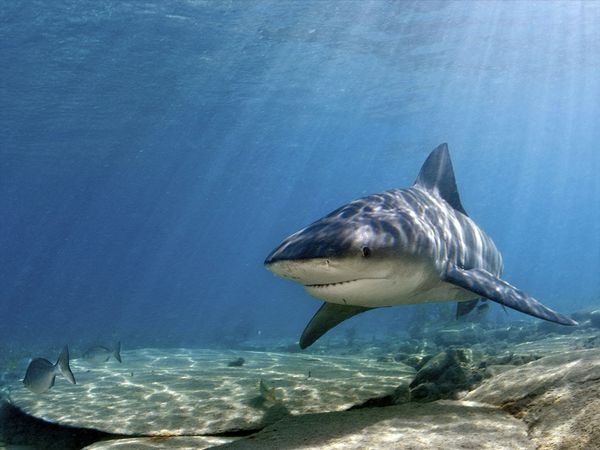 In the shallow part of the ocean, near the beach you will find this hungry Bull Shark looking for unsuspecting victims like surfers and swimmers. This species of shark is aggressive and account for most shark attacks across the coast lines, like Florida or California. According to the National Geographic Society (2011), the Bull Shark orCharcharinus lecuasis known for being a carnivore and the world's most dangerous shark out of all of its cousins like the Great White Shark or the Tiger Shark. The shark is larger than a human, so it may mistake the swimmer or surfer for a food and take a bite. He is why I'm afraid of swimming in the ocean!